*Uses an average 345 day gestation period for a Alpaca. Alpaca gestation periods can generally be anywhere from 335-350 days. The Alpaca Pregnancy Calculator is an easier process to use than the Alpaca Gestation Chart. The Gestation Chart is where you had to count the days until your Alpaca’s due date. Alpacas are induced to ovulate, meaning going through the ritual of mating induces ovulation. Females Alpacas conceive after just one breeding. Artificial insemination is quite hard, but can be happen. Alpacas conceived through artificial insemination cannot be registered. Once a female gives birth, she is generally receptive to breeding only after 2 weeks. Female Alpacas can reach maturity between 10-24 months. Twin alpacas are rare and have a one in one thousand chance. The lifespan of an Alpaca is around 20 years. 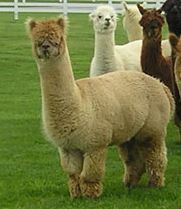 GestationCalculator.com is providing this Alpaca pregnancy calculator as a service. Our goal is to help visitors answer the question: ‘How Long Are Alpacas Pregnant For?’. It’s important that you enter the 1st day your Alpaca was bred for it to work properly. Some Alpaca Breeders will find this tool very helpful. So remember to bookmark it. Also, try using any of our other gestation calculators just for fun! Please direct any questions you may have to askabreeder@gmail.com. The Gestation Period for Alpacas is approximately 335-350 days from the first breeding. Alpacas will generally conceive after one breeding. But do sometimes have trouble conceiving. The Alpaca Gestation Period Calculator above attempts to generalize the estimation of the due date. It uses a 345 day gestation period for alpacas. The babies of an alpaca is called ‘cria’.